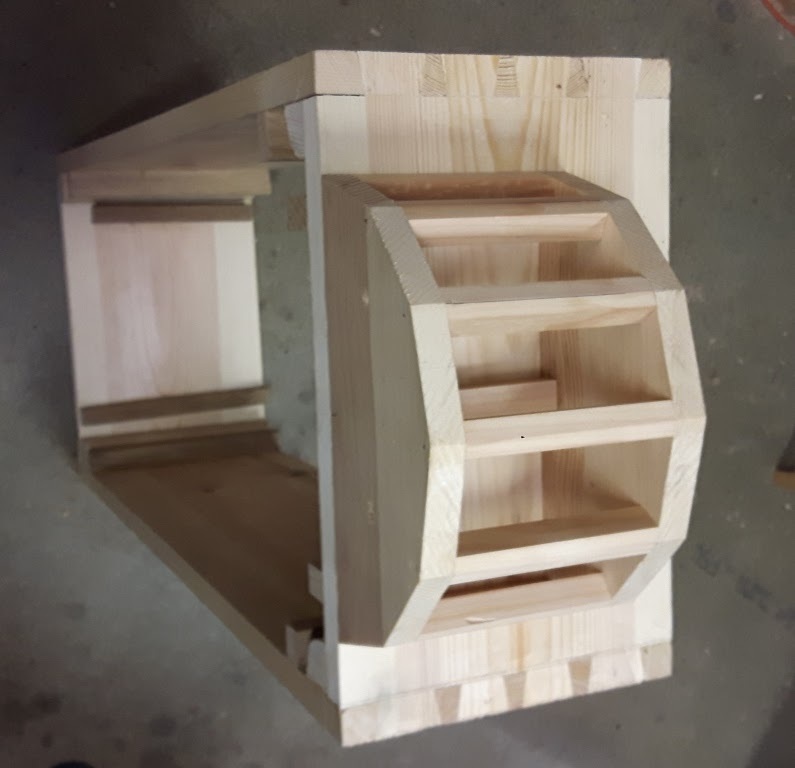 Construction of the small organ for schools is slowly progressing. All that remains to be done are the bellows and reservoir and the 48 wooden pipes. 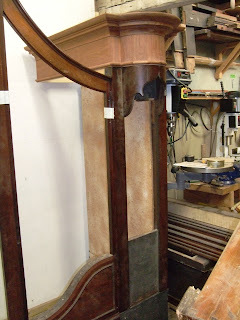 A new back for the upper part of the G P England organ case undergoing restoration in my workshop is now complete and the casework is now much more stable. The larger middle tower cap is now also in place. A few discrete plates and blocks also add significantly to the stability. The left hand tower has three gilded dummy pipes in place - not original at all (and from another organ) but just to give an idea of what it will look like when complete. 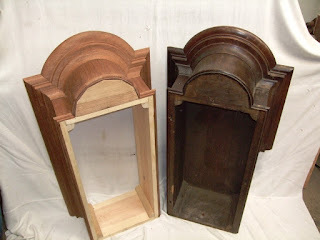 The next step is to tackle the lower part of the case - which unfortunately has been rather hacked about over the years and will therefore be a longer job. 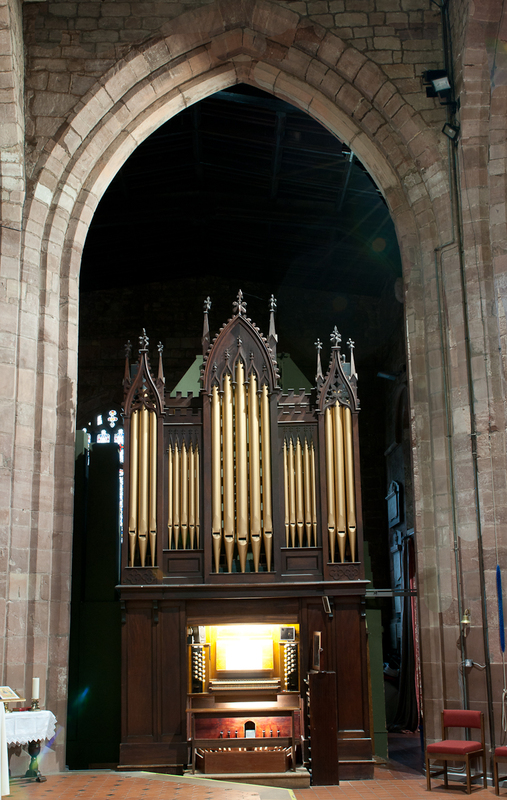 The Parish Church of St Peter in Chester installed a new Willis organ in 1856 to replace an organ that was deemed not loud enough. This 'inadequate' organ was probably installed in 1818. When the new organ arrived the old organ was advertised for sale in a Chester newspaper and appears to have been bought by Saltney Primitive Methodist Chapel who ceased to use it at some point and it was placed in storage. The organ is by George Pike England (1767-1815) - one of the finest organ builders of the late-Georgian period. 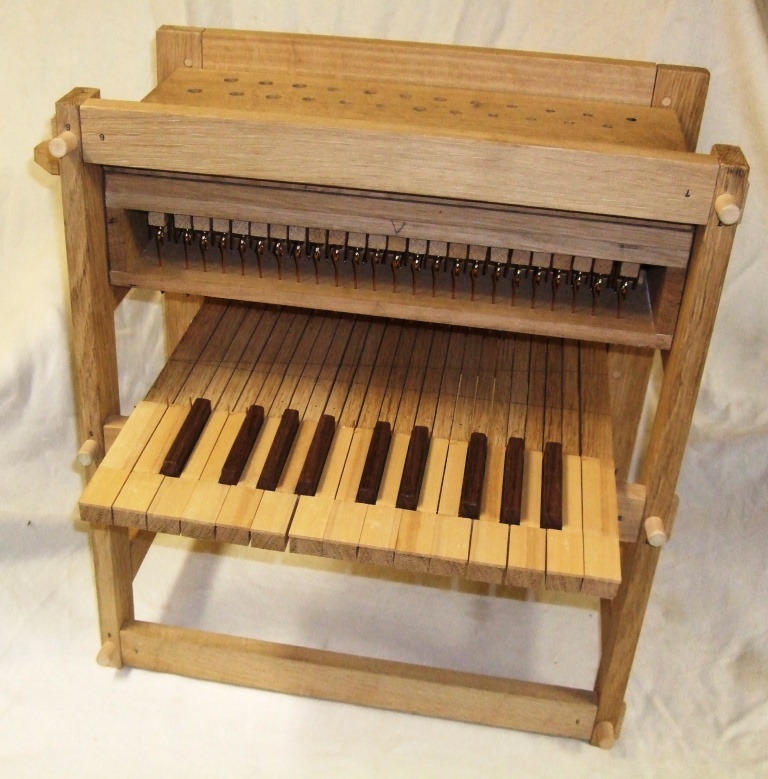 It is a one-manual organ of five ranks in an unusually large case for such a modest instrument. 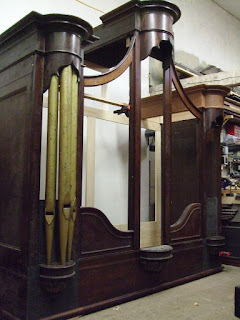 Martin Renshaw acquired it and is currently restoring the organ in his workshop in France. My task is to restore the case. During its travels one of the tower cornices was lost and I made a copy last year (see my earlier post in November 2017). 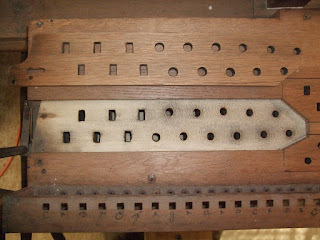 The first step was to assemble the upper part of the case to see what was missing/to be restored. The entire back of the upper case is missing - so the middle tower cornice cannot be put in place yet. The light coloured cornice on the right hand side is the copy. The interior of the solid mahogany side panels was covered with fibre board - hence the light inside of the far panel. This has now been removed. Here is a closer view of the new tower cornice. 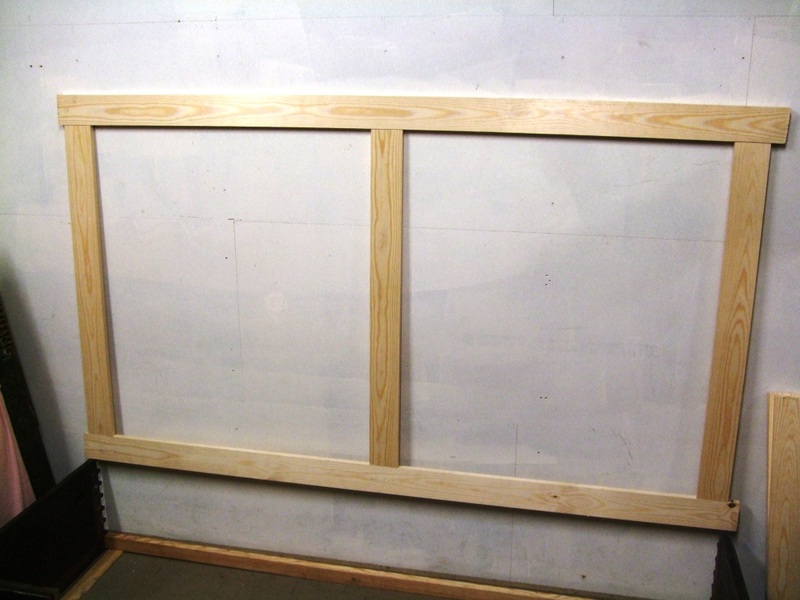 The new frame for the back of the case is underway. 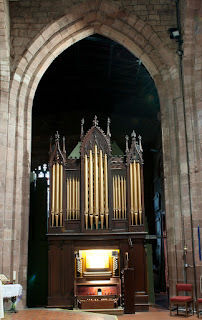 This project is of particular significance to me as the first organ that caught my attention was the G P England organ (c1811) in St Andrew's Shifnal Shropshire - my home town. When I first encountered the organ in the late 1960s and early 70s it was part of sprawling 3-manual instrument Abbott and Smith instrument buried in the south transept. Andrew Freeman photographed the organ in 1938 (see below, courtesy of the Cadbury Research Library, Univesity of Birmingham) - just around the time that my father - William Alfred Shuker (1915-1998) was a choir member, organ blower and bellringer in the church. I only played the organ once - very tentatively -, but I do recall noting that a number of stopknobs had 'England' engraved on them. 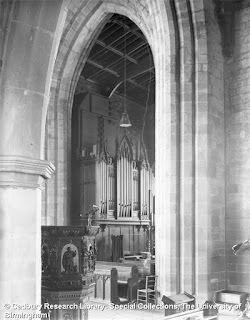 In 1973 the organ was rebuilt as a two-manual instrument by Hawkins of Walsall and relocated under the arch of the south transept. I attended the opening recital given by William Smallwood although I can't recall the programme - hopefully some English eighteenth century repertoire was included. 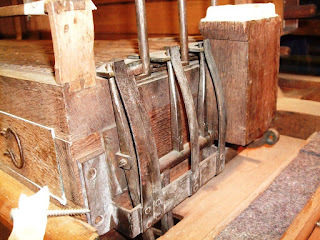 By the standards of the time it was a good attempt to return to something like the original England organ but the large pedal division and the proliferation of couplers made it a fairly unauthentic restoration. It is interesting to see that after 45 years some major work is planned and the photo below comes from the organ appeal website. It is therefore with some considerable frisson that I find myself working on an organ case made by G P England. I have to say that my preference is for the classical case fronts rather than the Gothick varieties, as at Shifnal, with the rather fussy details surmounting flat towers. The fun of the eighteenth century classical organ case with sensuous curves on the pipe flats and clean, round towers was beginning to give way to an overwrought heaviness that. to my mind, is a feature of Victorian design. I have recently acquired several collections of books on pipe organs and their history. Most of the books are in excellent condition and quite a few are hard to find. 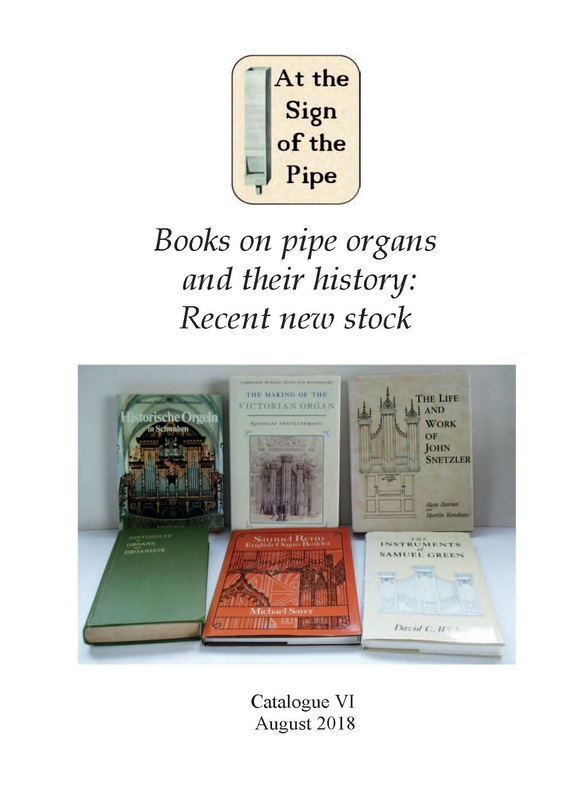 The first catalogue out with some of this new stock is No VI (August 2018) which lists 77 separate titles. A PDF file of the catalogue is available here. Further catalogues will come out shortly. For the past month or so I have been working on the restoration of a remarkable survivor from Revolutionary France. 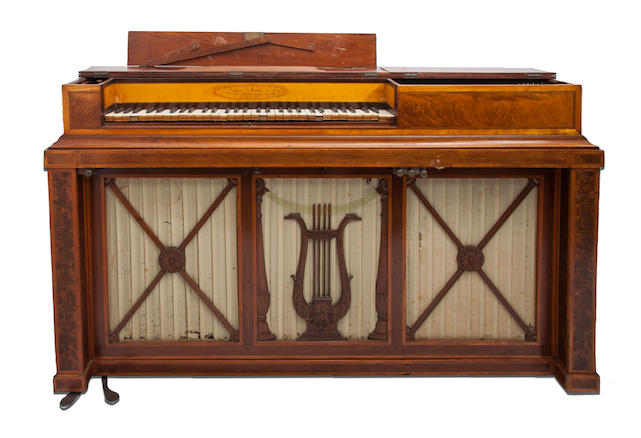 I have been interested in organized pianos for some time and the 1791 Erard organized piano is a particularly fine example. An almost identical model from the same year is in the Cité de la Musique in Paris (see here) and it would seem that these two instruments are the only two that survive from about fifteen that Erard made in 1790 and 1791. 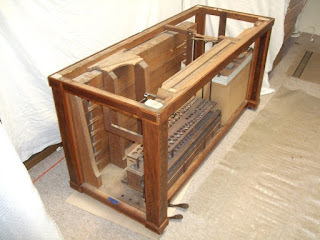 This is what the piano looked like when bought by the client for whom I am doing the restoration. The organ pipes are all in the case below the piano. We are still trying to find out the history of this instrument but it is clear that various work has been done both the piano and organ over the past century or so. However it would appear that apart from the replacement of the foot-blown bellows and reservoir by an electric blower there have been only minor repairs to the action and pipework. 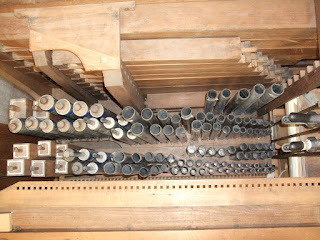 Remarkably, the pitch of the organ appears to be entirely original as there is no evidence for alteration of the pipe lengths. 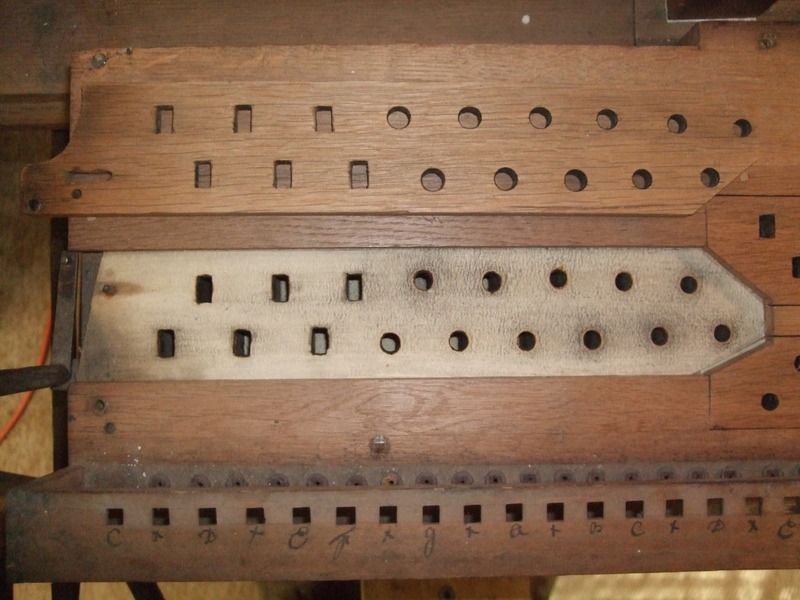 This suggests that the piano and the organ have not been played together for a very long time as the piano has suffered somewhat from excessive string tension as the pitch has been raised. There is much more to be learnt from this instrument. I will be posting updates from time to time. 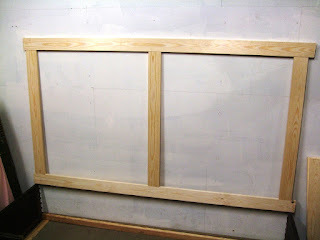 In the meantime here are a few photos from the early stages of the restoration. The beautifully made oak sliders on a leathered table. 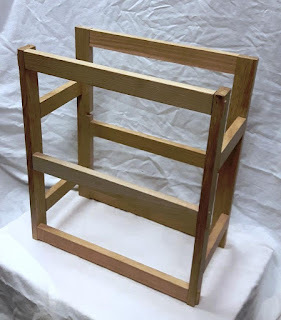 An interesting little challenge came into the workshop recently. 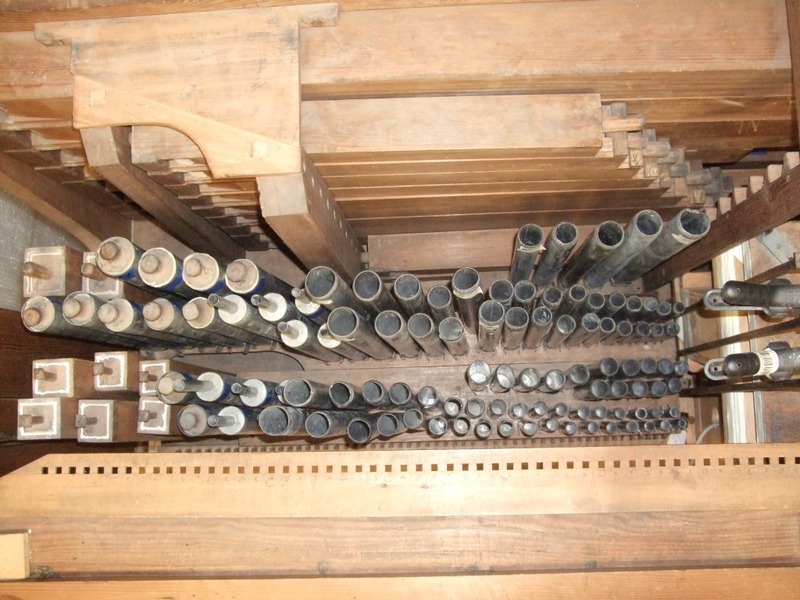 Part of the case of a chamber organ made by George England in about 1760 was missing. 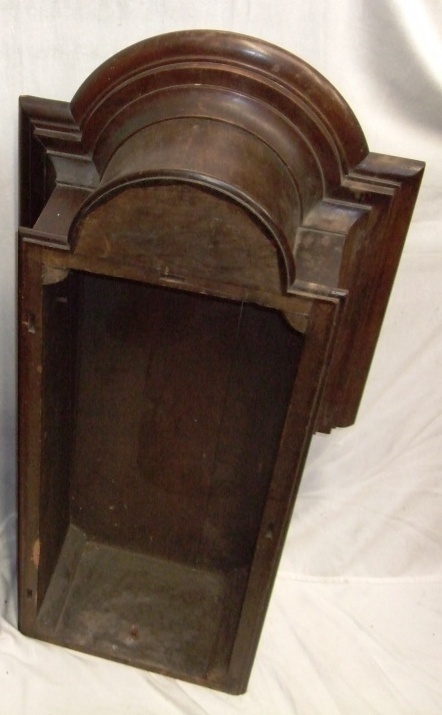 This particular case had been in storage for many years in various locations and one of the tower caps had somehow been mislaid. The tower caps are very distinctive features of organs of this period and with quite complex mouldings. The task was to make a copy of the matching tower cap. 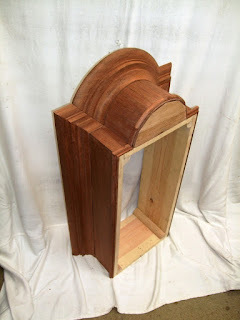 The tower cap is made of mahogany on a pine carcass. 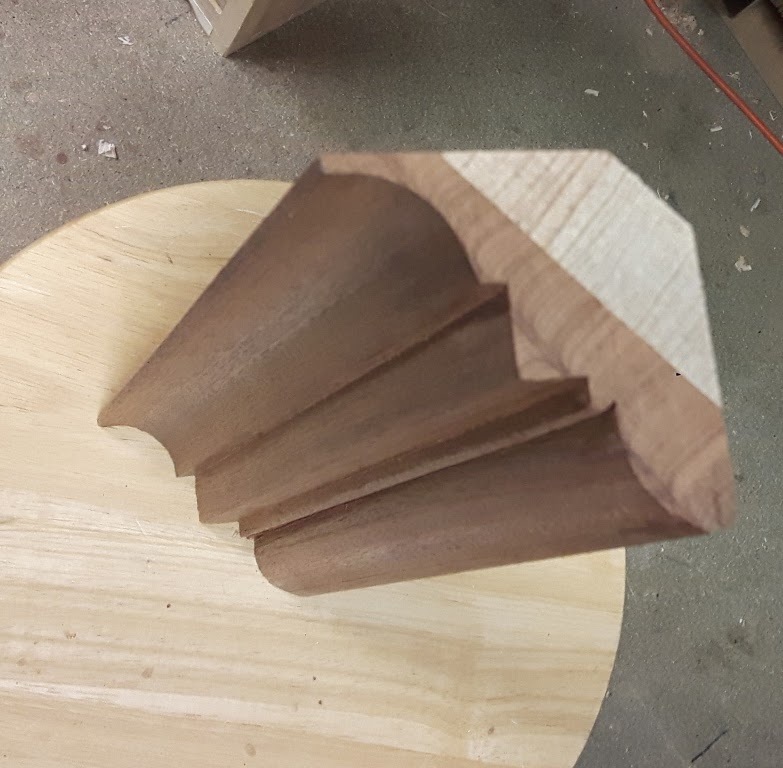 The side mouldings are made separately and all the profiles were made by hand using a mixture of traditional wooden moulding planes and more modern (but now discontinued) Record combination planes. 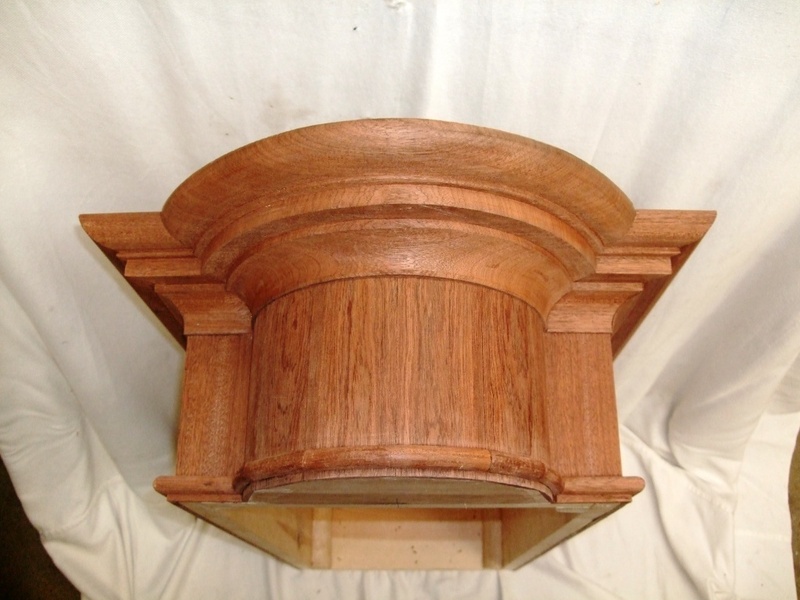 The top of the cap is solid mahogany and had to be carved by hand as the radius was far too big for my lathe. I suspect that the originals were made as a pair with a circular cap made on a large lathe and then cut in half. 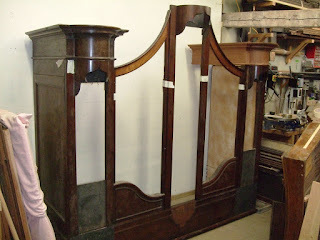 The rest of the carcass is covered with a mahogany veneer and smaller mouldings. There is also a pine 'roof' on the tower cap to keep out dust. 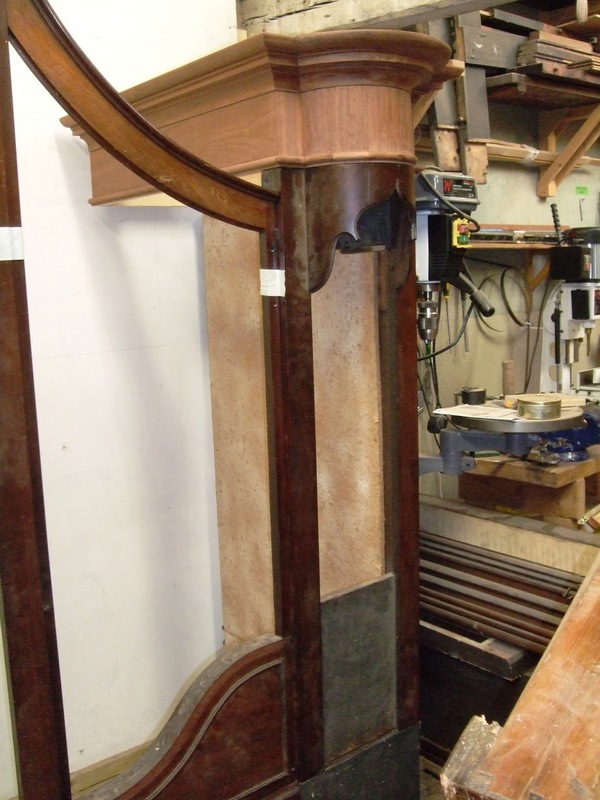 The natural mahogany colour will be stained and polished to match the rest of the case later in the restoration.